Eltronicschool. - There are many electronic circuit schematic which be designed for Alarm system application. One of the fire alarm circuit schematic is using the main component that called with Thermistor that will give low resistance when this component is hot. Thermistor easy detect the fire and indicate it that suitable with our goal to build simple fire alarm system. With only combine thermistor with other component like transistor, resistor, capacitor, and IC to build oscillator like NE555 IC, we can build our self the fire alarm system simply look like in Figure 1 below. Circuit schematic like in Figure 1 above is Fire Alarm System using Thermistor and NE555 IC. The major component are needed in this circuit are thermistor and NE555 IC. When sense the fire with the high temperature, thermistor will give low resistance and when no fire or low temperature, thermistor will give high resistance. When thermistor detect fire, it will make it becomes hot and it gives a low-resistance and give easy path for the positive voltage +6V to R2 and D1. And output the D1 will be gave to the base of transistor T1 and also to charge up Capacitor C1 with the positive supply voltage and it will increase the the time for which the alarm is ON. The larger the positive bias applied to the base of transistor T1 (BC548) when it is gave the larger the value of C1. Then the collector of transistor T1 is coupled to the base of T2, the function of transistor T2 is provide a positive voltage to pin reset of NE555. The NE555 IC will produce frequency depending on component resistors R5 and R6 and capacitance C2. This IC will begin generate frequency in it's output pin 3 when reset pin 4 in high condition or get positive source from PNP transistor T2. 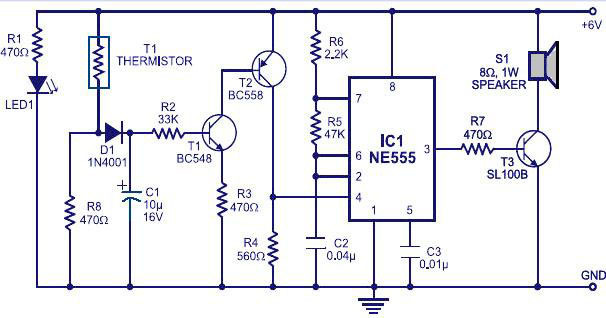 To make sound of fire alarm system is loud, the output pin 3 NE555 coupled with base of transistor T3 which drive the speaker to generate alarm sound loud.